Compost is like chili–everyone has their own recipe. You throw in what you find in the fridge, it takes a while to cook–and it always smells good when it’s done. Compost is much better for your garden than chemical fertilizer. It adds structure to soil and releases nutrients slowly. In many ways, it’s one of the last free lunches–at least for your plants. Even the purchase of a compost bin pays for itself when it saves you from buying just three bags of lawn fertilizer. Can you almost taste those juicy ‘free’ tomatoes? 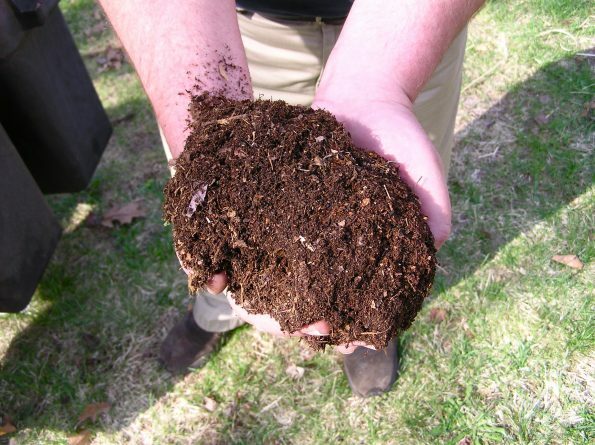 Spring is the perfect time to consider composting because lawn debris makes a great base to get things cooking! MIX IT (UP). Put in all types of organic matter – from your lawn, from your refrigerator, from the pizza crusts under your teenager’s bed. Just no meat or pet waste! Variety will keep things from compacting and maintain air flow for optimal decomposition. HYDRATE IT: Like Goldilocks – medium is just right: damp but not soaked. If you see mold spores scatter when you turn it, it’s too dry. If it stinks, is tightly packed, looks wet and glossy, or has water dripping off, it’s too wet. If you’re not using a lid, make sure the pile is shaped with a depression on top to capture water. STIR IT. Turn it at least once a year to mix in bugs, yard waste, oxygen and moisture. Experts often use two bins, turning from the first into the second. SEED IT. Increase microorganisms by adding leaf litter, compost or soil to get things brewing. HEAT IT. The warmer it is, the faster it decomposes. Black bins absorb the sun’s heat, so put them somewhere sunny. A lid also helps retain heat. Composting is actually just slow combustion. WORM IT. The open bottom of the bin needs to be in contact with soil to allow worms and moisture to get in. ASH IT. Wood ash from your fireplace will speed composting–but mix it in well. SORT IT. Sticks, bark, corncobs, pine cones and similar coarse items will take much longer to break down. Start a separate “slow compost” pile, or CHOP IT so these materials will break down faster. CHOP IT. Chopped lawn debris can be put directly into your compost and small bits break down quickly. Mulching lawn mowers are the best way to go because they can handle more than just grass which will add healthy variety to your compost. You can even compost black and white newspapers pages, paper towels, tissues, and sawdust. You should not compost plastics, metal, glass, or anything toxic (like lead paint chips). Remember, don’t place food waste in the bin unless it’s very secure against animals! Finally, if you’re just starting out, don’t expect too much at first. It’s hard to start a batch in spring and have it ready by fall. As always, we’re here to help. Feel free to contact us about getting started, buying materials (there are great deals online), or any other questions!